HER WORD AS WITNESS Q&A with Sharifa Rhodes-Pitts (she wrote the NY Times-lauded Harlem is Nowhere) and me; moderated by Marva Allen. Happy NEW Year!! I know it's way too late to be asking about Thanksgiving and Christmas/New Year's plans, but nonetheless, I hope you had a great set of holidays including Martin Luther King, Jr day! Mine were super relaxed and recharging, and now I can't believe we're actually 19 days into 2012. Several months ago, I learned that designer Rachel Roy had created a clutch to benefit the charity OrphanAID Africa. This non-profit is dear to my heart because it works to address the issue of Ghanaian families who can't afford to take care of their kids. In Ghana, and in many so-called developing nations, poor families find themselves in a position where they feel they have no other option but to send their children to wealthier relatives/employers to work as servants (house girls, house boys, garden boys, etc). In some cases, these children are sent to orphanages. OrphanAID Africa supports families at this breaking point, offering financial assistance, job training, and other tools to help keep children at home with their families. In Powder Necklace, my character Enyo is an acknowledgment of this phenomenon, and in my upcoming book Maids and Mothers, I explore this issue more deeply. Perhaps I identify with this phenomenon so closely because I was sent to Ghana as a pre-teen. I was sent for different reasons, and pretty much pampered by my family; left alone to sulk about my desire to return to the States, but it still struck me deeply to see adolescents and teens working as household staff. As I've gotten older, it continues to bug me. I hate to think of money separating children from their parents and vice-versa. 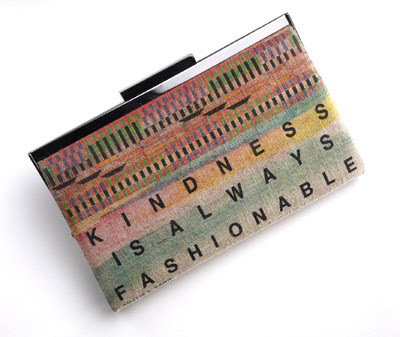 To that end, I ordered a few of the Rachel Roy clutches--100% of the net profits went to OrphanAID--and decided to sell each with a free copy of my book. The clutches are $49; about 10" long, and divided into a small and big compartment inside that can fit a wallet, keys, lip gloss, and other similarly sized things. There's also an inscription inside that reads "For my kids in Ghana. [heart] Rachel Roy." If you're feeling the premise of OrphanAID Africa / admire Rachel Roy's work / need a cute spring/summer clutch / been meaning to pick up a copy of my book, you can satisfy all of the above on my website till the clutches run out.